Say it with words. 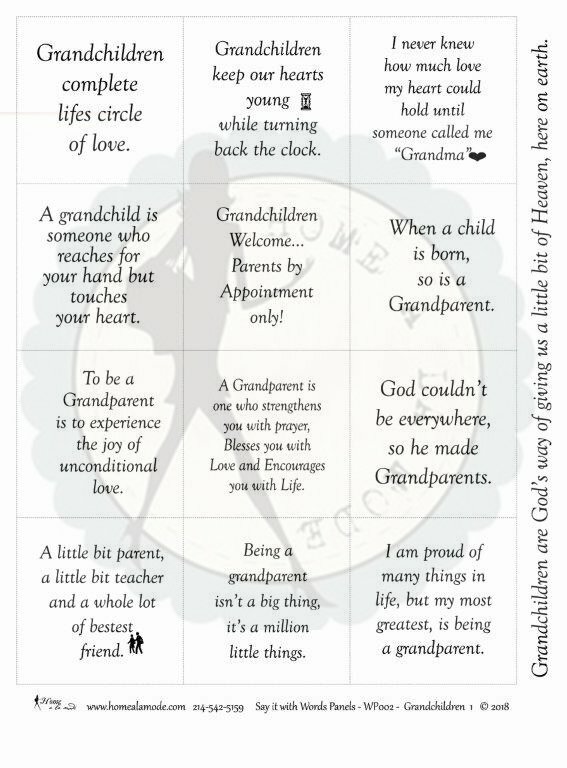 Grandchildren is a Home a la mode word panel that is all about the serious side of our feelings and the fun learned rules for our Grandkids... like: Grandchildren complete life's circle of love. - Grandchildren keep our hearts young while turning back the clock. - I never knew how much love my heart could hold until someone called me "Grandma" (or many other names for Grandma) - A grandchild is someone who reaches for your hand but touches your heart. - Grandchildren Welcome...Parents by Appointment only! - When a child is born, so is a Grandparent. - To be a Grandparent is to experience the joy of unconditional love. - A Grandparent is one who strengthens you with prayer, Blesses you with Love and Encourages you with Life. - God couldn't be everywhere, so he made Grandparents. - A little bit parent, a little bit teacher and a whole lot of bestest friend. - Being a grandparent isn't a big thing, it's a million little things. - I am proud of many things in life, but my most greatest, is being a grandparent. - Grandchildren are God's way of giving us a little bit of Heaven, here on earth.